But, how do you assure that your unwanted items get to people who would find them helpful? My previous two blogs recommended donating goods to nonprofits, selling your stuff, and giving things to friends, family, and community members. These techniques limit you to the people you know or get to know. There is another way, which I have used for the past several years. Through using a local, Internet-based bulletin board, you can announce your offer, and interested people can pick items up. To find a group where you live, go to Freecycle.org. First, sign up. You’ll probably be given a choice of getting e-mails or reading the offers on the Web. Many people make a mistake at this point and end up getting more e-mails than they can handle. If you can’t figure out how to manage your settings, ask a technically minded friend. Write your offer, describing your item as precisely as possible. Follow the directions. For example, many groups insist that you put the location at the end of your title. This is helpful to readers who need to figure out if they can get to your pick-up point or how much gas they will need. Then the “fun” starts. You get e-mails from people. You decide who will get the item—and arrange for pick up. Fifteen polished 11x13 inch wooden boards that were too beautiful to throw out. Many people asked for them. A preschool teacher picked them up so the children could sit on the floor and color pictures on them. A bag of stained and shabby clothing that was clearly useless for charity. I made it a point to describe the condition accurately. To my surprise, a woman asked for them. I wrote her again re-explaining their condition. She responded, “I am going to use the material to sew clothes for my sons.” She picked them up. Small plastic boxes that were part of packaging designed to be thrown away. So far, groups of 20 have been picked up by a beader, a coin collector, and a parent of a child who makes model boats. Many items on my local list are worth a lot and are definitely not trash! A friend of mine asked me to freecycle a working fax machine. It was picked up by a woman who could not afford one herself. She took it and thanked me, telling me that it would make a big difference in her small business. I have given away a voice recorder, a paper holder that didn’t fit on my computer monitor, two new bedsheets and a bedskirt, and other unneeded new items. My Rolodex uses 3x5 cards that are no longer available. Buying a new organizer meant retyping all of my addresses. I posted my dilemma on the bulletin board. Someone wrote me and told me how to make the cards. And someone else mailed me the cards that fit my Rolodex. The experience of giving and receiving this way shows me the generosity in the world. A whole community of people is eager to help strangers. We all are paying it forward. Together, we are creating an economy based on human connection. Once a recipient is selected, I exchange a few e-mails to ascertain that they really want the item, request a specific time, and sometimes ask for a phone number. Unfortunately, many people have legitimate difficulty with transportation and organizing their lives. We shouldn’t harshly judge them. For example, a woman with several children tried and tried to find the time to pick up some dishes. But she just couldn’t coordinate a car, childcare, and a time when she didn’t have another obligation. It’s okay to decide to work with someone and help. But it’s also okay to remember that local freecycling bulletin boards are not charities. Their mission is to keep stuff out of landfills. Sometimes, you will get a lot of requests for a particular item. I had one sad situation where a lot of people wanted a space heater. It concerned me that these people lacked heat. So, how do you choose? Our area moderators recommend against giving your item to the first person who replies. I have found that e-mails that have only a few words often are written by “no-shows.” I like to give my items to people who let me know how they will use them. You can pick randomly from among the e-mails. And the space heater? It went to the person who appeared to need it the most. It does take time to write and post the messages and manage the response. Personally, I find it worthwhile to know that my things are going to an actual human being who will use them. Many people point out that it is a lot of work. But we do need to stop throwing things in the trash. 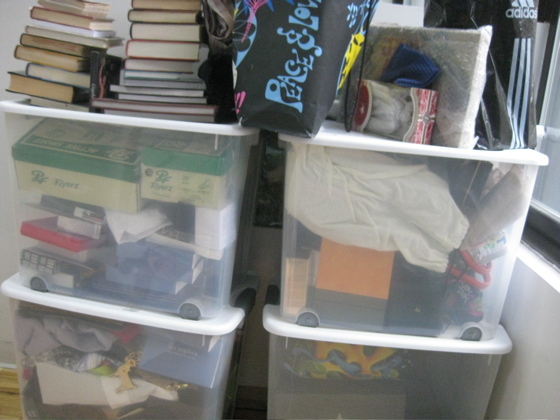 The other options, mentioned in my two previous blog posts (“Giving Away Your “Declutter” to People Who Want It” and “Donating Your ‘Declutter’ to Charity”) are good ones. Read New Dream’s Guide to Sharing for other ideas about sharing your stuff. Giving things away that you no longer need will free up space in your home—and allow you to experience the happiness that comes from doing a good deed. I want to close by thanking the volunteers who do the hard administrative work of establishing and moderating local freecycle groups. You are creating an alternative economy—a generous and friendly community that enables us to help and be helped. And you have kept a lot of items out of landfills. Dale S. Brown works on a portfolio of projects that empower people both in personal growth and political power. She lives in Washington, D.C. and is a published author of five books in addition to being a guest blogger for New Dream. Her early blogs describe how frugality financially empowered her, enabling her to take an early retirement at age 50 and live on her income. Her blog combines her personal experience with research and interviews.